Q: Where can I find my session’s link so my audience can get translation on their mobile devices? A: It’s very easy! The following instructions explain how to locate your session-specific URL. This URL always points to the session it was created for. If you want to share a URL that can change what it points to, learn about managing the /z shortcut here. Find your session on the Sessions homepage and click on its title to open the session editor. 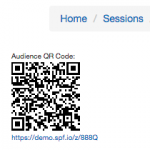 On the right-hand side of the session editor, you will see a QR code and a link. Share the QR code and/or the link with your audience. You can also print a poster with the link and QR code.